Buy this 8-DVD set from Amazon for only $69.99. The official fifth season of DIGIMON hits stores for the first time in the U.S.! "The fifth season of the Digimon series, DIGIMON DATA SQUAD’s release is timed to the airing of DIGIMON FUSION, an ALL-NEW Season 6, on Nickelodeon. Nickelodeon is airing all seasons of Digimon and DIGIMON DATA SQUAD to massive audiences of loyal fans of the anime franchise. Synopsis: Our heroes and the members of D.A.T.S. 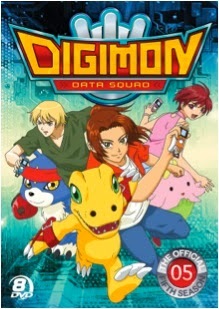 (“Digital Accident Tactics Squad”), an organization created to conceal the existence of the Digital World andDigimon from the rest of mankind, are facing a massive conflict between Earth and the Digital World triggered by an ambitious human scientist determined to make use of the Digimon for his own personal gain." DVD FEATURES: Villain Photo Gallery; Character Guide Booklet. Do you have a Digimon fan in your house? For me, my husband and 6 1/2 yr. old nephew are huge fans of Anime and Digimon in particular. So, when they saw I had the official 5th season to review, they were quick to offer up their review services. And, before the stomach bug hit us on Saturday, Friday night was a Digimon marathon. While the girls and I were catching up on their princess shows they had me record, my husband and nephew were having a blast watching the last season of this hit series. The Digimon Data Squad 8-DVD set includes all 48 episodes from the fifth season, plus a bonus photo gallery and character guide, that fans will love. While my husband and nephew only got in 10 episodes Friday, they were able to finish watching them throughout the day on Saturday and Sunday. And, while they had seen all 48 episodes previously on Disney XD, this is one show that they both said they could watch over and over again. Now, my husband is able to say that he has the complete Digimon Data Squad series on DVD, as this rounded out his collection. :-) And, he and my nephew will be able to enjoy their favorite episodes from this popular Anime series whenever they want. With Easter right around the corner, this new 8-DVD set would make for a great gift idea for your Digimon Data Squad fan's Easter basket. And, at only $69.99, you can't go wrong with this price, as you are getting 8 DVDs with a total of 48 full-length episodes, plus fun bonus features. Any Digimon fans would go crazy being surprised with this recent DVD release. I know as I made my husband and nephew's weekend. And, they were still talking about it this AM at breakfast.